Happy Tuesday and today is Day 1 of the Fresh Squeezed Stamps August Release! This is a fun set with so many different elements that work together to create fabulous birthday cards and invites! For my card I brought colour into the stamping by matting in bold colours,Using Copic markers to colour my PARTY bubble and Stamped the cake on Patterned Paper. These stamps that stand on their own in black and white look fabulous in colour too! How adorable...love the sweet little birthday cake! What a fun sentiment with the bubble wand! Cute card Tracey!! So cute. Love the images and the card you made. What fun stamps! love the bubbles sentiment (SO creative!) and that yummy cake! That is a cute idea for a stamp... with the bubble wand...never seen anything quite like that! Love how you used your stitched mats for the layers. Love the party bubble ! Too cute! This is very cute. That cake looks adorable in patterned paper. Adorable, Tracey! I love that clever bubble word image!! Love these images done in color--really fun card!! Love this! Such fun colors and I love how you've combined so many of the stamps from the set. SO much fun!!! Love this birthday card!!! 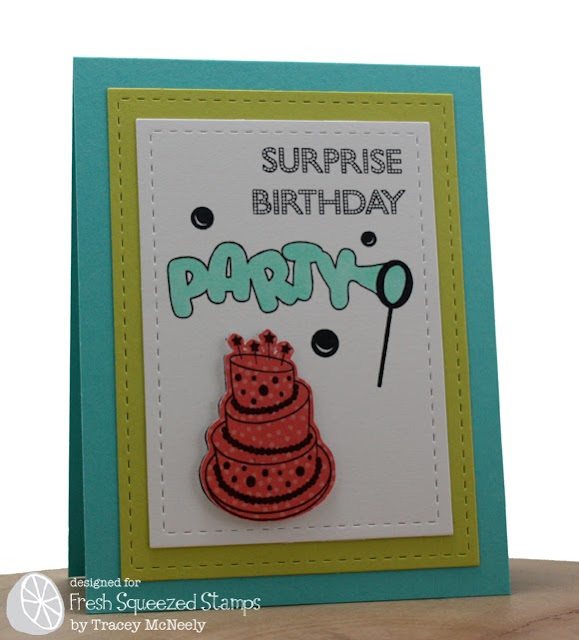 I have never seen a stamp quite like that party bubble - fabulous card!